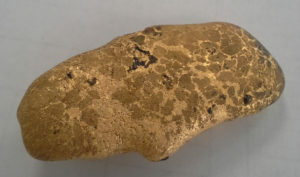 A doré bar is a partially refined gold bar. Doré bars are typically a super high gold content alloy, sometimes actually pure. However, they have no uniformity or set standard. Gold doré bars are the result of removing all non-metal particles out of the gold ore, and consolidating the gold bearing naturally formed alloy into a single chunk. Most often, gold doré bars have, other than gold, mostly silver left in them, plus often other by-products of the gold mining process. The main reason for creating doré bars is to facilitate handling by now dealing with larger chunks of gold bearing alloy, rather than loose particles. In that sense, doré bars are basically the last stage between mining gold ore and refined gold bullion. The idea is that doré bars are pure enough, and large enough for gold refineries to handle. Although gold doré bars are generally made from gold mining material, they are also made by melting gold jewelry into single bars. To better illustrate doré, consider the following examples. A gold prospector collects a good bit of gold nuggets and gold dust by gold panning in a river. The gold bearing material he has is very clean considering that it is basically gold in its natural state. In addition, it is basically an accumulation of gold bearing alloy particles and with still a little bit of hard to remove dirt. To make it easy for him to transport, the prospector decides to smelt all the material into a single chunk. In the process, most of the non-metal particles are removed. The result is a single, larger size piece high gold content alloy. There are no hollows, dirt, or other such things. Just metal. What he has now is a gold doré bar. A gold buyer has a good bit of miscellaneous gold jewelry of different grades. It all fits tightly in a sandwich size bag. To make it easier for him to handle, he melts the jewelry into a single piece. The piece is about one quarter the size as before. There are no hollow spaces and the bar now easily fits in a pocket. In the process, all stones where removed too. So he now has a single gold bearing piece of alloy rather than a bunch of gold jewelry. What he has now is a gold doré bar. Gold doré bars are easy to handle in comparison to having all kinds of loose stuff. That is their function. They are not ore, they are not bullion. They are just chunks of high gold content precious metal alloy.